There are many worms that attack trees. Forest Tent Caterpillars for example are pest caterpillars that attack trees in the late spring or early summer. They are generally more cosmetic than destructive. 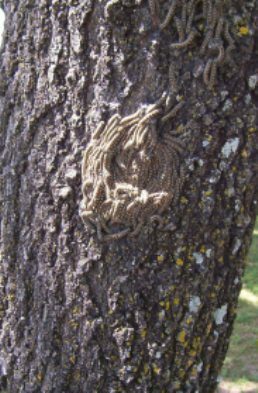 Canker worms hang from threads and other worms eat and/or roll up leaves. The control of all these larvae of moths and butterflies, the process is the same. Release trichogramma wasps as the leaves start to emerge in the spring and as a last resort spray Bt (Bacillus thuringiensis) per label directions at dusk. Add 1 tablespoon molasses per gallon. They can also be killed with sprays mix of plant oils or mound drench mixtures of orange oil, compost tea and molasses. Products that contain spinosad will also work.